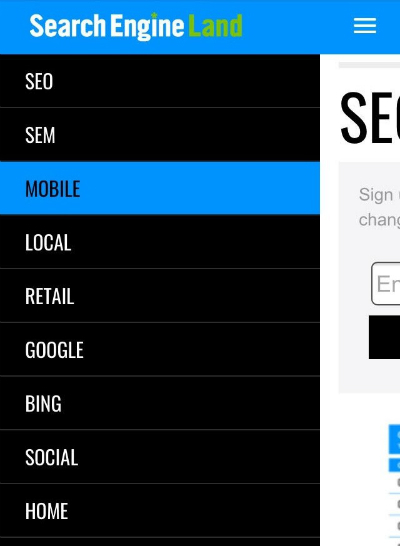 Your mobile navigation (menus and internal links) contribute to all three and must work for users and for SEO. Make life easier for people visiting your business site on a mobile device. Note: All of the mobile navigation tips mentioned in this article are equally applicable to separate mobile sites, responsive design sites, and sites that dynamically serve web pages. If you’re not sure what that means, or which mobile platform is best for you, read our Cheat Sheet for Mobile Design. Many mobile phone screens are only 720 pixels wide in portrait mode. Designing mobile navigation means designing for a small screen size. With limited real estate available, there’s no room for clutter. Get right to the point then cut the fat. Ask yourself, what links need to be included to help your user complete priority tasks? What elements from the desktop navigation aren’t relevant in the mobile environment? To save your user from decision paralysis, we recommend you limit your mobile navigation to four to eight items on the top level. Your mobile navigation menu is not the place to link to every page in your site. To keep it short and sweet, you may even consider adding a top-of-page logo that navigates to the homepage and leaving the Home button out of your navigation all together (as on the BCI website, below). Some mobile navigations require multi-level navigation to aid user experience. This is more common with ecommerce websites. If you must go there, keep it as simple as possible. Don’t add more than one sublevel of dropdown functionality. If your navigation must include more items, a vertically oriented navigation activated from a menu icon is the best option. 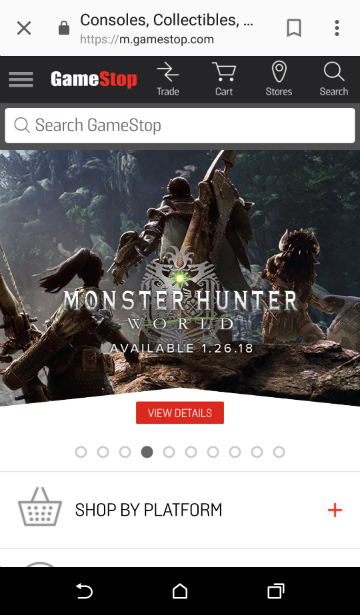 GameStop uses static navigation across the top of its mobile-friendly view. A navigation that requires horizontal scrolling probably won’t be mobile-friendly. Some sites have the resources to design a sleek image-based carousel type of interface, such as what Google uses for certain search results. That might be an exception, but consider your audience. Your website users don’t have a lot of time — or patience. How can you help them get to the right place faster? What are your most important pages? What are the top category pages outlined in your siloing strategy? What are the most common actions taken by site visitors using smartphones? 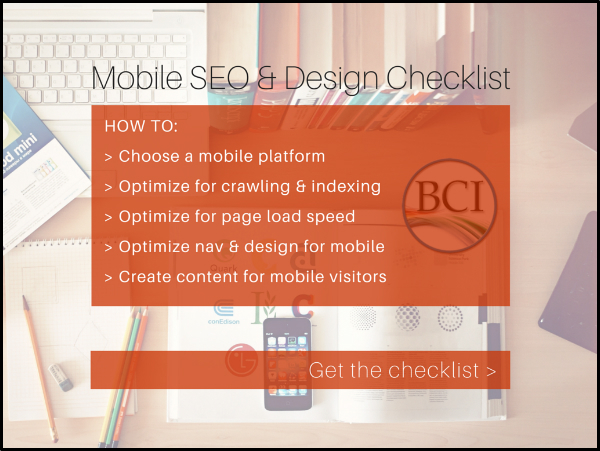 What pages of your website most effectively satisfy a mobile user’s needs? The answers to these questions influence not just which items go in your main menu, but also which links and calls to action you should put on each page. You’ll want to keep your main navigation menu consistent throughout the site. It should point to the top four to eight landing pages (such as main category pages). A short-and-sweet mobile nav is a win-win for SEO and your users. It preserves the flow of link equity to your most important pages while also helping users get around. Once users arrive on a page, contextual links can move them to wherever makes sense. These links can be added within the body content of each page in a comfortable way. Show a TL;DR summary at the top of a long article. If readers want more detail, they’ll scroll down. Give anchor links at the top that jump a reader to the different sections below (as I did at the top of this article). Include useful calls to action and links to related pages within the body copy, where they make sense. When it comes to mobile users, quicker is always better! It will take some work for you to make each page deliver the most appropriate navigation options. But you’ll improve user experience and no doubt your ROI by giving visitors a more direct path to what they need. While we’re on the topic of “quicker,” remember that fast mobile pages make for a better user experience. Google announced that page load speed can factor into your Google search rankings, so a streamlined navigation helps with mobile SEO. You can test your mobile page speed with Google’s mobile speed test (or use our SEOToolSet™). Mobile users look at search as navigation, and you should too. Consider Amazon.com. On mobile, Amazon doesn’t even bother with the category dropdown (although it’s there under “Departments” if someone wants it). What’s prominent at the top of the mobile view is a simple “Search” box. Even with its massive catalog, Amazon doesn’t expect users to navigate through menus to find what they need. Most of the time, customers just type in a product name and go directly to buy it. 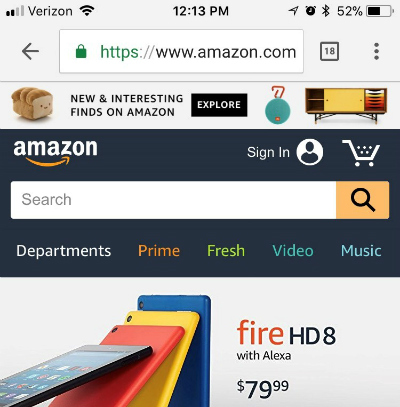 The Search box is Amazon’s most mobile-friendly navigation option. On mobile, your search box is often the most direct route to what a user needs. Set it up and make sure it works well! Your customers work hard enough; navigating your site should not be work. To make your navigation intuitive, menu language should always be written in a way that lets the user know what to expect. It should be clear what the item does if it’s a dropdown, and exactly where it goes if it’s a link. If you are using symbols to convey information to your users, make sure they are clear, conventional symbols. For instance, if your menu items drop down, use an intuitive symbol like a plus sign (+) or an arrow (>) to let your users know a click will reveal more options. Another best practice example would be using a magnifying glass to indicate a search feature. If you are using a toggle menu, use three stacked lines — the icon highlighted in the example below — to help the user locate and access your main nav. 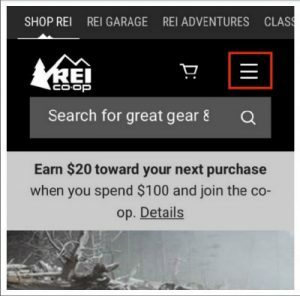 REI’s menu opens from a hamburger icon. TIP: A hamburger-style menu icon like this often gets more clicks if it also has the word “menu” below it according to A/B testing. If your design has room, you might test this to see if it makes your mobile site more intuitive and increases clicks/conversions. The goal is for your mobile navigation to make life easier by limiting thinking, scrolling and clicking. It’s worth noting that since 2015, Google has displayed URLs in its mobile search results differently than it does in desktop SERPs. The change replaces a web page’s URL with a description of the page’s location in a breadcrumbs-like format. If this doesn’t scream of the importance of siloing and clear hierarchy, nothing does! Now, rather than showing a page URL, Google’s mobile search results display a breadcrumb path beneath each title. Your website users shouldn’t have to zoom to read any of the text on your mobile website, including the text within your navigation. Tiny text that requires zooming creates a bad user experience, and neither your website users nor Google or Bing like poor user experiences. All of the text on your mobile site needs to be large enough to be read on a variety of devices without zooming. This principle needs to be a top priority that you consider as you build your mobile-friendly CSS (cascading style sheets) to control the appearance of text on various devices. To make your navigation text easy to read, choose a font that naturally adds enough space to distinguish between letters and is tall enough to be clearly read in a menu. Your font size and style also depend on your brand’s style guide and what fits your unique demographic. For instance, a young audience may not struggle with smaller or condensed fonts as much as an older demographic would. The way you handle formatting such as bullet styles, capitalization, margins, captioning, and so on should also reflect what’s attractive to your audience and comfortable for them to read. Once you decide, set up your CSS and create a written style guide to keep your content consistent. For designing the look of your mobile navigation, best practices can’t give you a one-size-fits-all recommendation. What’s important is that every word on your mobile site can be read easily without zooming. I recommend you perform user testing to see first-hand whether your font is tripping up users. Also, make sure there’s sufficient contrast between your text and its background. WebAIM guidelines offer rules for color contrast (recommending a minimum ratio of 4.5 to 1). You can try their contrast checker tool to see how your text treatment measures up. This tip applies to body text; consider a shorter maximum length for your menu options. Not sure if your text is easy to read? 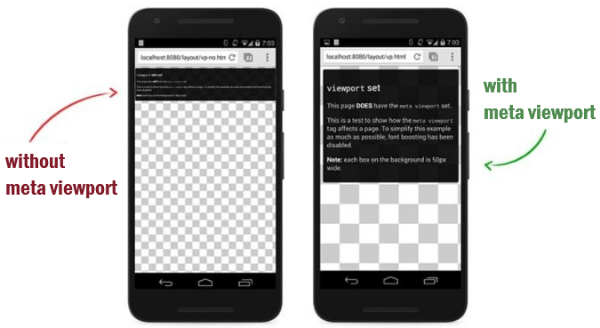 Run your site through Google’s Mobile Friendly Test tool. Tablet and smartphone users rely on touchscreens to get them around websites. While a pointy mouse arrow allows users to precisely select items in tight spaces, the average finger requires a larger target to press. Many users don’t hit a touchscreen exactly where they are aiming. 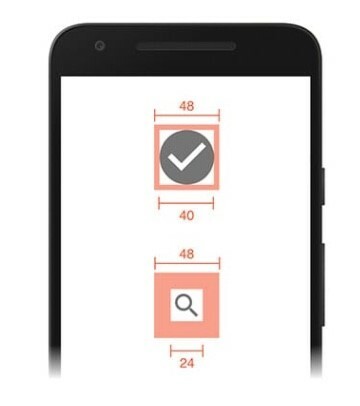 Google recommends building mobile pages with a minimum touch target size of 48 pixels with a properly set viewport (more on that later). And touch targets should be spaced about 32 pixels apart, both horizontally and vertically. Build navigation buttons with a target smaller than 40 pixels and your user experience plummets. Visitors end up sloppily navigating to the category above or below the one they want. Since people are so bad at hitting their tap mark much of the time, it can also help to incorporate touch feedback into your navigation. Your feedback could be a color change, a blink of color, a font change or another visual cue. Color changes show which menu item is touched on SearchEngineLand.com. If you are using multi-tier navigation, it’s also important that you make sure your dropdowns are activated by touch — not mouse over. Clearly, hover navigations work just fine in the desktop experience, where hovering is a possibility, but they leave mobile users stuck. Another touch-friendly option is to design a supplementary navigation that uses images and exaggerated graphic buttons. This type of navigation can be a great homepage asset that gets your visitor headed in the right direction quickly. 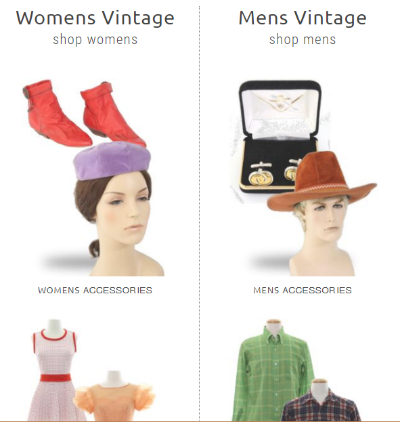 Vintage clothing site RustyZipper.com uses large graphic “button” with text labels for mobile-friendly navigation. It’s important to note that graphic buttons like these should only be a supplemental option used alongside a toggle navigation or a static top navigation. You need to have a consistent navigation that the user can access at the top of every page. While you may be able to include this graphic navigation at the bottom of your mobile pages, it’s not optimal or practical to use these big graphic buttons as your primary navigation. And always consider the load-time performance impact of images and buttons. You also want to avoid intrusive interstitials — those popups that monopolize the screen when a visitor clicks through from a search result. In January 2017, Google rolled out an intrusive interstitial penalty for mobile search. Apply a delay or time interval between views so you don’t annoy your visitors. Reduce the amount of screen space your element covers. Try a bar or box that scrolls in from the bottom or side. Avoid covering the middle of the mobile screen or obstructing your navigation elements at the top. Let no be no. If a user closes a form, don’t display it again within a reasonable period of time (perhaps a week later). Chances are good that interested website visitors come to your website using multiple devices over a short period of time. To help them feel confident they’re in the right place, it’s smart to give your mobile and desktop sites a consistent visual theme. Your mobile and desktop navigation, however, do not have to be — and sometimes should not be — identical twins. While the colors, fonts and themes you use for your mobile and desktop navigation need to be consistent to reinforce your branding, the similarity may end there. Your mobile navigation needs to help users navigate around your website and accomplish tasks. Consider the content your smartphone users need and the tasks they are looking to accomplish, and then build your mobile navigation specifically for a smartphone user. What mobile-specific calls to action need to be built into your navigation to aid user experience? Does it make sense to include a “Call” button or a store locator? Can a mobile user easily find essential information like your address, directions, phone number, hours of operation, or other facts? Remember: Space is limited, mobile needs are unique, and on-the-go patience is minimal. Because website visitors will use a variety of devices and screen sizes, specify a viewport using the viewport meta tag. 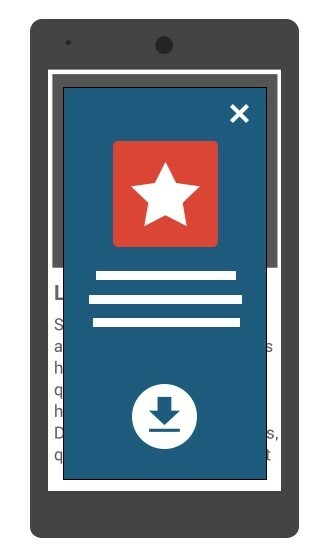 Websites need a scalable meta viewport for correct display on smartphones. Common mobile mistakes include having a fixed-width viewport that doesn’t scale for all devices, or assuming too wide of a viewport, which forces users on small screens to scroll horizontally. Creating a mobile-friendly navigation means creating a customer-friendly navigation that gets your personas moving in the right direction right away. If you build an intuitive navigation that is easy to use, your website users will be headed toward conversion happiness in no time. Build a navigation that is frustrating or confusing, and they’ll be headed back to the search results and straight toward someone else’s website. Be a leader — share this post with friends or colleagues who are as interested in UX as you are. For more resources like this one, subscribe to our blog. EDITOR’S NOTE: This article is an update of an earlier post written by Chelsea Adams for the Bruce Clay Blog. very good tips given in artical for Mobile-Friendly sites Thanks for your useful information. Very interesting information you shared with us. On these days most of the people use smartphone so all the thing they want to check by the phone. Actually by this device people can check almost everything. Even people watch 3d movies by their phone with VR box which very top notch right now. People also do photo editing by their phone, even shopping is happening by phone, so this is really important, a site should being mobile friendly because of people don’t have enough time to open fold then booted up their machine this is why smartphone friendly a site very much needed. A good mobile navigation considerably reduces the bounce rate and makes it easy for users to find what they need. Thanks for sharing some of the best practices for making a mobile-friendly navigation, which include an intuitive navigation, listing the important pages first, using a consistent navigational menu, placing an effective search box, etc. Greta article, I alway make sure I adopt your top tips when designing mobile pages. Keep it simple and intuitive! yeah its true that responsive design is a good solution, but there are other ways to create a mobile website. If you use WordPress to power your site, you can use a responsive theme or a mobile plugin. Well written, useful article you shared. Thanks for the article. Being web designer, I am inspired to read these innovative mobile navigation tips that I must follow in future. Thanks for sharing this informative Article. You have listed some good techniques for mobile-friendly navigation. I will definitely try this for my SEO Project. Hi Jessica – Responsive is our preference because a responsive site is easier to maintain and Google’s preferred design. A responsive theme makes that easy for WordPress users, too, as you mentioned. But separate mobile sites can have faster loading times and other advantages, if you don’t mind the extra work of maintaining two sets of code. Some excellent pointers in your comment that I know will benefit readers, so thank you for adding your recommendations! Though responsive design is a good solution, there are other ways to create a mobile website. If you use WordPress to power your site, you can use a responsive theme or a mobile plugin. There are also some nice DIY solutions like Mofuse and goMobi. You want to research services, though, and make sure they have all the features you need and that you have control over domain settings and redirection. If you want to create your own stand-alone mobile site, I recommend using HTML5. Mobile browsers are up-to-date, so they recognize most of the nice features HTML5 has to offer. You can also focus on semantic mark-up for your site if you use HTLM5, and that will improve your search placement. There are some nice HTML5 templates (look up Fone and HTML5 boilerplate) that can give you a nice start. Responsive Design help to drive traffic from all online devices. Thanks for sharing this content, is very informative for me. Google also focusing on mobile optimization and their page speed so website owner need to updated for the same. OK, I will try these tips, at least I hope it can make a bounce rate for my website in mobile display would be better. Looking out for any good mobile practices, thanks again for the posting. Hi Malachi – Thanks for your good suggestion to show a picture of “MENU” with a hamburger icon. This has been added. To answer your question, Bruce has updated and expanded this article to cover mobile navigation best practices for 2018. The older comments you see pertain to the original version we published several years ago (as the “Editor’s Note” at the bottom was meant to clarify; sorry for any confusion there). Since this post has continued to be popular, we realized mobile nav design was a useful, necessary topic that is worth keeping evergreen! Too bad you mention that we should have “menu” underneath the hamburger button, but there is no example to show us what you exactly have in mind for that. Is this something that can be added? Thanks. Nice article to make your website SEO friendly. Dapa: Yes! This article is extremely relevant in light of Google’s recent mobile algorithm announcement. Would I change anything to better cater to the mobile algo? No! The mobile navigation best practices outlined in this blog post are all aimed at helping webmasters create mobile experiences that are quick, intuitive and user-friendly. Make your mobile experience speedy and user-focused/friendly and you’ll be in Google’s good graces, as well as the good graces of the mobile-friendly algorithm. Awesome work, I suppose this is even more apparent with Google’s soon to be released mobile-friendly algo tweak. Would you change anything you’ve said based on that? Thanks for the post. Always on the look out for any good mobile practices, thanks for the posting. Chris: Success! I am so glad that the information in this post was just what the doctor ordered. I, too, was having trouble finding a go-to resource that clearly outlined mobile navigation best practices — including pixel dimensions for finger-friendly tap zones — so, to solve the problem, I decided to write my own guide. (If you want something done right, do it yourself, right?) Helping people solve problems is the best part of my job. Mobile optimised website making is a good practice for web developers. because more than 75% of peoples using smartphone to interact with any type of website. whether it is health, computer and shopping related it doesn’t matter. Lately the best solution is to use jquery.mobilemenu.js. It converts your menu to an pull down menu which is much better for mobile devices then a css pull down menu which can become unmanageable fast. Agree, Anand! Let’s be honest — no one is good with mobile keywords. That’s why we have autocorrect — and even that tool can be a nightmare. I always want results immediately when I’m searching on my mobile phone; a navigation that gets me there with a click is ideal, whereas a search menu that requires me to use my fat fingers is a less-than-ideal plan B… especially if the search function isn’t sophisticated enough to recognize what I am asking for despite typos. Great piece. I can’t believe the number of online stores that get the first two points wrong. What this means for me as a user is that I have to often type out what I want on the tiny search field and I have never been good with mobile keyboards. It’s a pretty frustrating experience. Nice advice! I think, above outlined six points are good enough for mobile optimization to it’s maximum output. Design, Fonts, Contrast and navigation simultaneously form the suitable and perfect right matched value of mobile devices. Thanks for this relevant post. Yes, Partha!! Testing would be an excellent addition to this list. UX testing and user research needs to be at the heart of everything we do — from web design to writing meta descriptions to content marketing. At the end of the day it’s real people who you need to lead down your conversion funnels; it doesn’t matter how great your in-house team thinks your design is if your target audience think it’s too complicated/confusing/boring/etc. However, my #7.. Test, test, and test >> You cannot make it perfect however the goal should be – building an app or website as perfect as possible from both technically and non-technically. For that, you must conduct some extensive study of your target audience – individuals or communities. I definitely agree. Search engine optimization is also about create good experiences and that means easy navigation, site speed and legible content on mobile. Quite a well-written as well as beneficial article on Mobile-Friendly Direction-finding Guidelines. Cheers. Angelina: “These days mobile marketing and design is a hot topic.” You’ve got that right! It’s incredible all the resource time Google has been dedicating to create documentation that teach mobile optimization (and design) best practices. Have you seen these Google resources? Glad the article was helpful! Thanks for the read. Curious where you’re at in your mobile process; are you working on a mobile design, working with clients, or just interested because, frankly, it’s interesting…? A really well-written and informative post on Mobile-Friendly Navigation Best Practices. Thanks. Excellent tips for mobile friendly sites. A good user experience is what web designers strive for.